Nadia and Alan look for each other and finally cross paths at the deli. Something's not right but they're not giving up on each other. I'm going to review this as "season one" as although it feels like it could be a self-contained series, the fact it's been such a phenomenon means that a second season (even if they just use the premise to tell a different story) is at least highly likely. The show is about two characters, Nadia (Natasha Lyonne) and Alan (Charlie Barnett) who find that they are repeating a night of their lives on a loop, bookended by them dying. For Nadia, it's the night of her birthday party, thrown by her friend Maxine (Greta Lee) but for Alan it's the night he discovered that his fiancée Beatrice (Dascha Polanco) has been cheating on him. There's lots to admire with "Russian Doll", there really is. Initially I was concerned about how the premise would stretch to a series, when it seems unlikely that a 90 minute film would truly be able to - but through a series of flashbacks and some inventive evolutions as the loops occur they do manage to make the series compelling and arrive at a conclusion that feels natural and satisfying. It's also, pretty funny. It's not a conventional comedy, it's very much a dark one whether it's the frequent deaths or in interactions with homelessness, drug taking or mental illness. I'd also agree with some of the other reviewers that have suggested that it gets better as the series goes on, investment in the characters does increase - particularly as Nadia and Alan become more of a double act and try to work out if there's a way out of their situation. 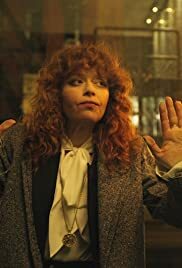 Despite the supporting characters with recognisable faces throughout the show (particularly if you watch plenty of Netflix) it's impossible to deny that this is very much Natasha Lyonne's show and it's an astonishing central performance of wit, pathos and capability that you hope should lead on to her finally getting the bigger roles she's deserved for a while. If there is more, then I do look forward to it, but as a contained series it works really well.